It turns out there’s some social media savvy on the Palestinian side as well. GazaTalk.com (warning: if you click around on the site you’ll see gruesome photos) launched January 1. I discovered it at about 5 a.m. January 5 (today), via a link in the tweetstream of Beshr Kayali. I have no idea who he is beyond the fact that his Twitter page says he’s in Damascus, and because I need to wrap this up quickly before a busy workday, I’m not going to research it. The GazaTalk.com homepage features the death toll scorecard badge above, along with links to articles, blog posts, pro-Palestinian “Gaza Tweeters” and more. 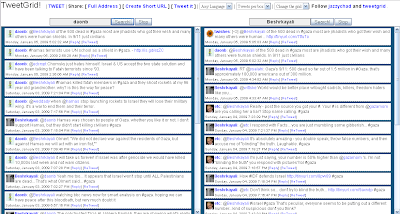 By using Tweet Grid — one of the many independent sites that have sprung up to leverage Twitter’s tweetstream — I’ve collected the most recent tweets from both Kayali and from Benny Daon. I don’t know anything about him either, but he gives his location as Tel Aviv. Beshrkayali: RT @ysalahi: Gaza’s 9/11: 500 dead so far out of 1.5 million in #Gaza. that’s approximately 100,000 americans out of 300 million. The two sides in the Gaza War may not be negotiating, but at least they’re tweeting. 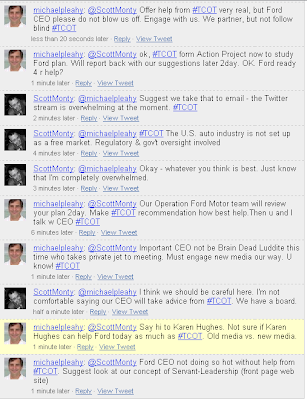 To be precise, Mulally was Tweeting by proxy yesterday, via Scott Monty. It only lasted a few minutes, but it’s still fairly cool. No great revelations on weighty policy matters, but I learned that Mulally makes a point of driving a different auto every day, including competitor models, to stay close to the public experience of driving. Not earthshaking, but humanizing. 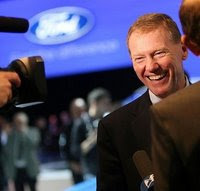 It’s notable that Mulally, a former Boeing exec, first started working for an auto company only two years ago. As I’ve written in previous posts, Ford is seeking to differentiate itself from the Big Other Two. It’s working for me. There are some obvious culprits: shortsighted American managers, schlocky designers, an insular corporate culture. Here’s another: the very structure of Wagner Act unionism. The problem isn’t so much wages as work rules–internal strictures that make it hard for unionized competitors to constantly adapt and change production processes the way the Japanese do.Now that everyone is criticizing work rules, it’s easy to forget that they don’t represent a perversion of the collective bargaining process–they are the intended result of that process, and were once celebrated as such. Yes, faced with successful Japanese rivals, Detroit and its union have been trying to reduce the number of work rules–but the process has been slow, like pulling teeth, especially because the UAW defers to its locals. My point, and I do have one, is that I’ve seen enough of the behavior of highly paid top union officials to understand that their focus is not on the best interests of their members. Their focus is on protecting their lucrative jobs, and the only way they know to do that is to be perceived by the members as being willing to fight to the bitter end to protect existing contracts. But in bankruptcy court, the contracts (theoretically, at least) can be voided. And that’s the level of change that will be required to put the U.S. auto industry on solid competitive footing with foreign automakers. 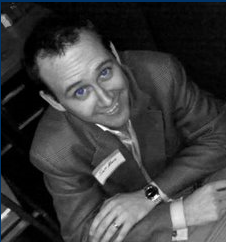 In the past few days, my humble blog has had a welcome flurry of attention because of a post I wrote describing the interaction between Ford’s head of social media, Scott Monty, and a new virtual organization called Top Conservatives on Twitter (TCOT). (What is Twitter, you ask? Here is a primer.) Having voted for Clinton twice I’m still not used to thinking of myself as a conservative, but I’m currently the 655th top conservative on Twitter, according to the group’s list. I’ve been moving up the ranks as more people sign on to follow my “Tweets” because of the publicity. [Are YOU following me on Twitter?] The original post got linked to from The Corner, sending hundreds of visitors my way and spawning other threads in the conservative blogosphere. I later did a followup post expressing admiration for Monty’s grace under pressure. Monty argues, convincingly to my mind, that under CEO Alan Mulally — a former Boeing exec who never worked for a car company before two years ago — Ford has gone much further than GM and Chrysler toward adjusting its business model to the emerging realities. TCOT is racing to try to reinforce that story — dozens of volunteers (including, to some degree, me) have mobilized over the weekend for Operation Ford Motor, an effort to help differentiate Ford from the others, while striking a blow for capitalism and the principles of market discipline. – To recognize Ford Motor Company’s efforts at avoiding accepting government bailout money. – To provide input to Ford Motor Company on why it is important to remain free-market focused, and not accept government loans. – Partner with Ford in making its example of a market-based approach the standard for American business without relying on taxpayer dollars. – Lay the groundwork for a market-based approach to turning around the auto industry, and the economy at large. This nascent potential partnership is fragile on both sides. Monty has been unfailingly polite, but has cautioned that he can make no commitment on behalf of Ford. He also pointed out, in comments on a blog I just can’t find right now, that the company cannot become too closely aligned with any particular ideology. And TCOT may well bail out of this project if members come to disapprove of Ford’s actions. I admire Monty and hope he and his company are successful in telling The Ford Story and differentiating Ford from the Big Other Two. Ford has already won some concessions from the UAW, and has refocused its business and avoided a cash crunch — it’s by far the healthiest of the three. But let’s say Chrysler and GM go bankrupt and shrink dramatically, while Ford avoids bankruptcy. 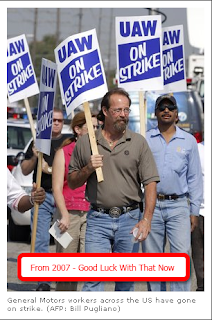 Ford could end up at a competitive disadvantage because the other companies are able to put more pressure on the union. Whatever Ford is paying Scott Monty, they oughta pay him more. He’s been Tweeting all day. Earlier today I described how Scott, the head of social media for Ford Motor Company, had his feet held to the fire by a recently formed virtual organization called Top Conservatives on Twitter. His day actually started well before the exchange I posted then. Around 9 a.m. he started trying to correct the “Big 3 Bailout” meme by pointing out that Ford, comparatively healthy, was not included in the failed bailout legislation. A Tweeter named 64 had quipped, “Can’t believe Daily News missed chance to run DC TO FORD: DROP DEAD this morning.” Scott replied, “@64 Ford wasn’t part of the proposed bill. See http://tinyurl.com/6hms95”. Then he was off to the races, and well into the evening he’s still Tweeting — he’s posted more than 140 Tweets today, all while serving as the public face of Ford Motor Company in the Tweetstream. Ford today sent fansite TheRangerStation.com (dedicated to lovers of their small pick-up trucks) a lawyer’s letter over copyright violations. This sent the dozens of other Ford fan sites, many of which use Ford branded names, into a tizzy over fears that they too would be asked to stop using Ford names in their URL’s and site materials. By the time the story surfaced on major car blogs like Jalopnik and Autoblog the story had been boiled down to Ford’s lawyers asking for $5,000 or the site gets shut down. It sounds like a clueless corporation alienating its fans, but the reality is more complicated. It turns out the site was offering counterfeit Ford paraphernalia for sale, and that (not the URL) was the reason for the lawyer letter. Scott sent the site owner a polite message of explanation, which is now proudly posted on the site’s forum. Meanwhile, TCOT is gearing up for Operation Ford Motor, along with other Action Projects. Watch this space for more updates in the days ahead. He points out that the announcement of no merit pay in the release he links is from Nov. 7, before there was any widespread discussion of an auto bailout. In re-reading this and my other post from yesterday, I don’t think think I’ve made it clear enough why Scott Monty’s efforts are such a big deal. I spent nearly 20 years working in PR/communications for huge companies, either as an employee or a consultant. Huge companies are risk-averse by nature, and communications pros at big companies tend to be even MORE risk-averse — having had their heads handed to them multiple times for small or imaginary gaffes. Scott is a breath of fresh air — and a braver man than I. After I posted last night saying he had Tweeted 140 times that day, he came back on with 20 more Tweets after midnight, and he’s made another 50 this (Saturday) morning. Virtually all of his messages are in response to individuals, some of whom are unfriendly — but what he says is out there for anyone to see. I’m amazed not so much by the sheer volume as by the fact that he clearly has a corporate mandate to fly solo. More than 200 Tweets in the last 28 hours — ain’t no way he’s running them by the Legal department, Government Relations, two EVPs, etc. Welcome, Twitterers, Diggers, Cornerites, readers from Social Media Today, Dalton’s Briefs, Northwest Indiana Politics, Kicking Over My Traces and others. If you enjoy this post, I hope you’ll take a look around the site. In addition to the auto bailout, I post a lot about the adventures of a red voter in a blue state, and on Iraq, the financial crisis, capitalism and more. Original post follows, more updates at the bottom. I don’t know what if anything will come of this, but it’s fascinating — beginning at about 10:30 a.m. today, Scott Monty, the head of social media for Ford (yes, there is such a function now), began a Twitter conversation with Michael P. Leahy, head of a new Twitter-powered conservative group called Top Conservatives on Twitter (#TCOT). As I said, I’m not sure anything will come of it, but I’ll report back when I know more. For now it looks like the bailout is dead in Congress, but the Bush administration is looking at repurposing some of the $700 billion financial bailout for the auto industry. Update: Operation Ford Motor now has its own hash tag, #OFM, if you want to follow the action today. 1:50 pm – The Corner post was the traffic champ until a few minutes ago, sending about five readers per minute. Now all of a sudden Digg has taken control. 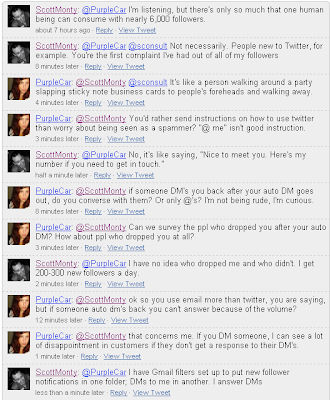 Scott Monty, good sport that he is, asked his followers to Diggit.